Google Adwords is a Pay-Per-Click advertising network. 1. “Organic” results – These are the results that appear on the left hand side of the page. No person or company pays Google to have their listing appear on the left hand side of the page. With proper search engine optimization, your listings have a greater chance of appearing on this side of a Google search result page. 2. “Sponsored” results – These are the results that appear at the top and to the right of a Google search results page. We also called these type of results “Pay-Per-Click” ads. The listings (advertisements) that appear in this area cost money. 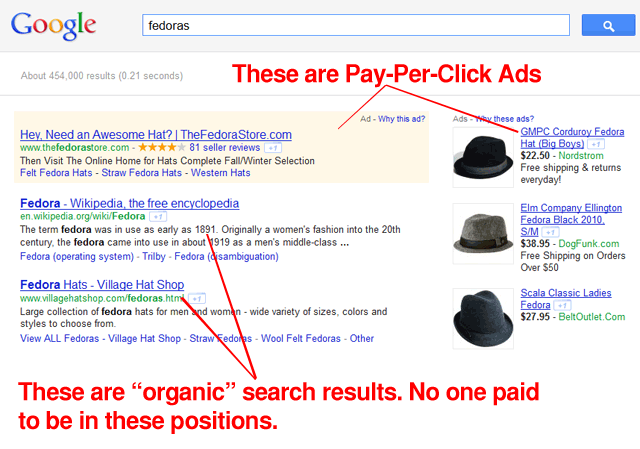 Advertisers pay Google “per click” to advertise there. Google Adwords has become very expensive. Newcomers to the system generally get wiped out early. Cost per clicks generally range in the $2 or higher category. You have to pay to play. The Yahoo/Bing advertising network is much less competitive and has shown to produce better returns on investment. Facebook has an amazing advertising platform because you can target by age and gender as well as likes and interests. The main difference with Facebook is that your ads will “burn” out faster because you end up targeting the same people with the same ad. This will cause you to have to come up with new ads on a weekly basis. You should also test and target different demographics, likes, interests and workplaces. Who is Google Adwords good for? At this point in time (2012), the one advantage Google Adwords has over all other internet advertising networks is that they have the most volume. Meaning: you can reach more people on their network over any other advertising network. The disadvantage is that they know this and therefore charge a premium to advertise on their website. Large brands with big marketing budgets – When we consult with large brands, we always recommend that they spend money on Google Adwords. The simple reason is, they can calculate a very accurate ROI compared to any other forms of advertising (billboards, t.v. ads, etc.). Also they can bid on their own brand name, to guarantee traffic for people searching for their company. Very niche businesses – If your business has a very specific niche with few competitors, then Google Adwords can be a great place to advertise. Marketers who have the time and energy to fight – If you really want to be on Google Adwords, and you have enough budget, and the persistence to learn every nuance about their system, AND be willing to manage your Adwords account a couple hours a day, every day – then go for it! With enough landing page testing, campaign tweaking and resolve – you can get Adwords to really get your business humming. But you have to have severe determination. Where can I sign up for a Google Adwords account? You can sign up for a Google Adwords account here. How much does it cost to have a Google Adwords account? At this time, there is no fee to join Google Adwords. As a matter of fact, if you look around enough you will probably find $25 to $50 in Google Adwords credit. As your webhosting company if they have Google Adwords credit you can use. Also if you submit your business to the certain business directories, you will sometimes receive offers from Google Adwords in the mail, usually including credit.